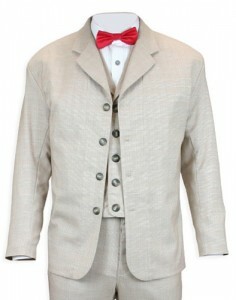 This sack coat is a fantastic match for my Wooster Waistcoat and trousers that go great together with my red bow tie. The cut is just perfect and way more exciting than that of today’s formal jackets. And yet it is much less prominent and unusual than a frock coat or a town coat. Don’t get me wrong, I also have a broad collection of those as well, but for some events a sack coat is just the perfect choice in the middle between a frock and a modern jacket, and this Wooster Sack Coat is a marvel with its delicate pattern, soft fabric and outstanding choice of slightly bigger buttons. I love it, and so did everybody who saw me wearing it! Callahan Vest – Black: Love my vest! When I initially bought it, I was planning to get it tailored, so I won’t be complaining about the fit. The vest has the matte black material all around, so it can be worn as a stand-alone vest. The two front pockets are real, not fakes. I have had it for a year now and still love it. Overall, this is a very sturdy vest and would definitely recommend it. 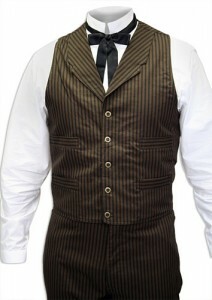 Ferndale Striped Vest – Brown/Navy: A Dandy of a Vest! Bought this and the matching Ferndale Striped spats to complete my patent medicine salesman ‘living history’ persona and am 1000% pleased with the fit and appearance. Both items look great in the website photos but are even more impressive in person. Really liked the higher neckline on this vest and the 4 pockets in front are perfect for everything from my pocket watch to a small bottle of ‘cure all’. 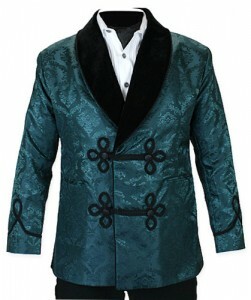 I’ve been fascinated by smoking jackets since I was a kid, watching old black and white movies. Every now and then I’d search for one, but they were either threadbare used ones, cheap costume types, or way too expensive modern day versions. Happened upon Historical Emporium and took a chance and ordered their vintage version. Love it! The material and construction are high quality. Looks and feels like it should cost a whole lot more. But the most important thing? Well, the difference between having a smoke, and having a smoke in this jacket is something that can’t quite be explained, it just has to be experienced. As other reviewers have noted, the quality and construction of this vest are first rate-and the fit is excellent, and runs true to size. This is my fifth, and likely not last, vest purchase from HE because, esp. for the price, you cannot beat their quality or selection. Like all my other HE vests, this one is wonderful as well. Also, HE vests fit me better than others I own. Not a re-enactor, I wear vests for work and to go out; I find suit jackets too confining. 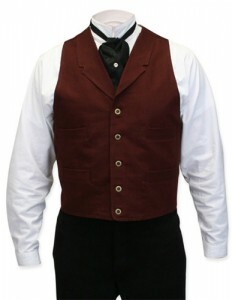 Many HE vests have lapels so they look more finished and complete on their own without a jacket. 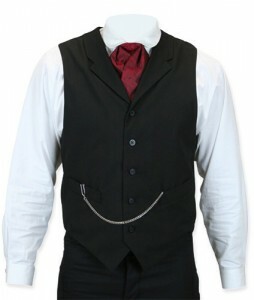 Of course, I can still wear a jacket with this vest if desired; looks great either way. . . Combine this with HE’s usual fine and fast service and, once again, I am a very satisfied customer!